We were fortunate to get a quick look at a male Polyphemus Moth at DeKorte Park's Science Center, thanks to Nick Vos-Wein of Ramapo College (which operates the Science Center). 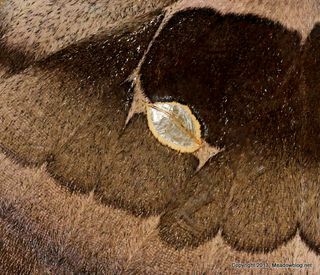 Nick had found the moth's cocoon on a Gray Birch in DeKorte earlier this spring. 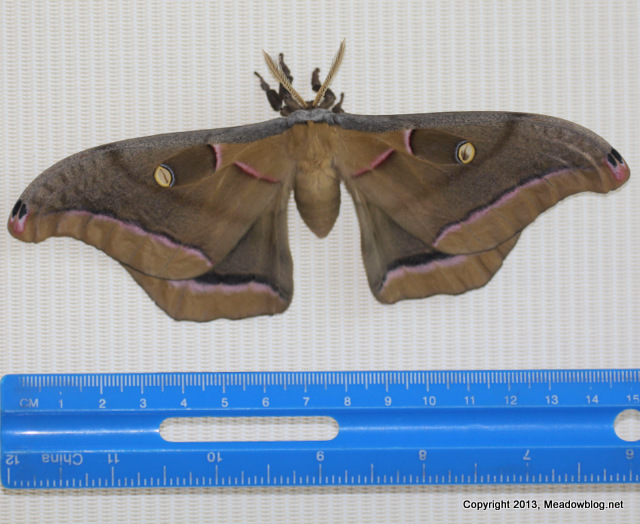 This silk moth has a wingspan of 6+ inches, lives just a few days (without eating), mates and dies. The moth was released on Tuesday, when it was ready to fly. Much like the clear-winged moths, the Polyphemus has a clear panel on each wing (close-up on right). 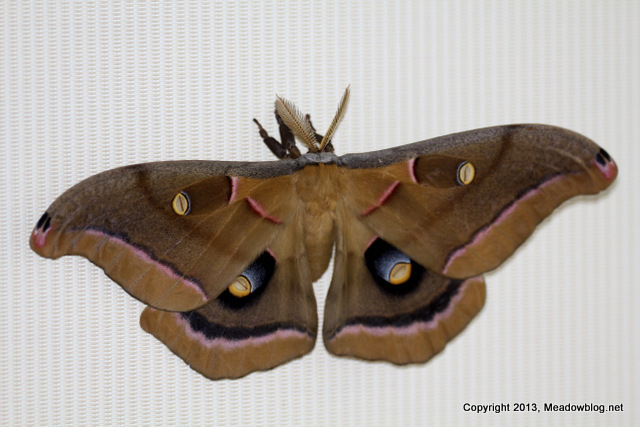 The moth is named for Polyphemus, a Cyclops of Greek mythology and "The Odyssey". 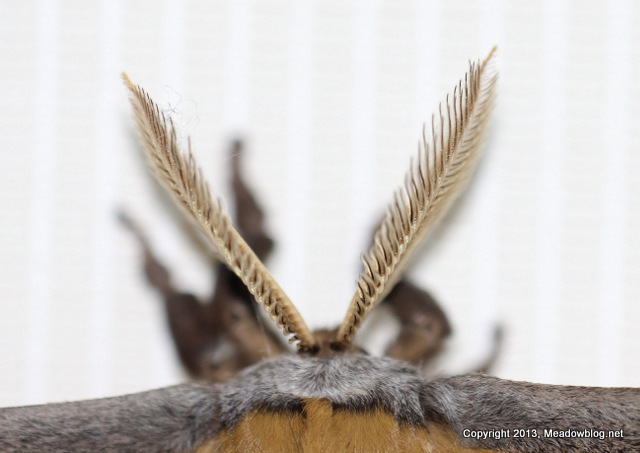 More on the Polyphemus moth here and here. The moth's appearance is a great reminder that the Meadowlands Commission and Bergen County Audubon Society are once again part of National Moth Week this summer. We will be hosting a Moth Night featuring NMW's amazing crew and light set-ups at DeKorte Park on Tuesday, July 22, at 8:30 p.m. 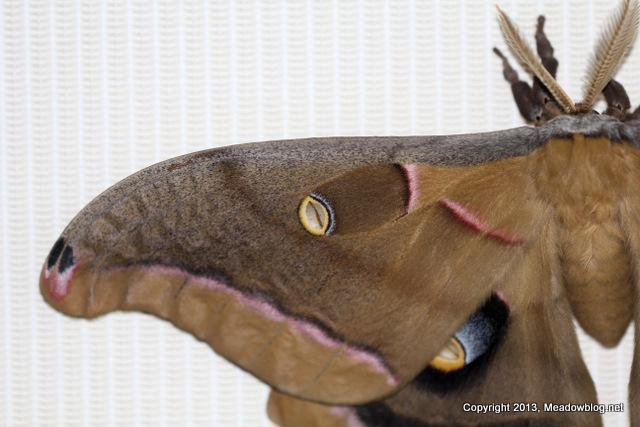 Tomorrow: A couple of photos of the Polyphemus after it was released.